Several years ago, a friend recommended the Richard Sharpe stories by Bernard Cornwell. I had been reading Patrick O’Brian’s Aubrey-Maturin stories, and my friend thought I would like the Sharpe stories, which also were set in the era of the Napoleonic Wars. I didn’t take him upon the recommendation then, but when I finally did, I realized how right he’d been. 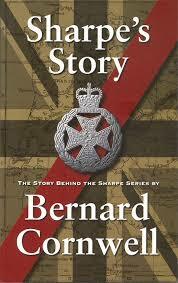 Bernard Cornwell is a terrific storyteller, and Richard Sharpe is a terrific character. A rogue, but as Cornwell puts it in Sharpe’s Story, he’s “our rogue.” In this booklet, Sharpe describes the genesis of the character and the series that bears his name. He also explains why the books were written in the order they were, and how the successful BBC series influenced the stories. I’m reading the Sharpe stories in the order of the events they describe, not in the order of their publication, and I’d recommend others to do the same. Sharpe’s Story also includes “Cakes and Ale” as an appendix. This is a short memoir Cornwell wrote describing the circumstances of his birth, his adoption by highly religious parents, and his eventual rejection of that family and their religion, together with his reunion with his birth family. As a Christian minister, I have to admit a bit of disappointment at Cornwell’s conversion to “atheism and frivolity,” as he puts it. Nonetheless, I appreciate Cornwell’s outstanding talents as a writer and plan to continue reading the Sharpe stories, and perhaps Cornwell’s other books. They are outstanding examples of how historical fiction should be written.